The sofa is the most important piece of furniture in your life — more than the bed, more than the kitchen table. It’s the “investment piece” that’s always worth the extra spend. It will fall apart if it’s cheaply made, and it will ruin your entire design existence when it does. Your interior will not recover from your poor decision-making, and you will be judged on this. 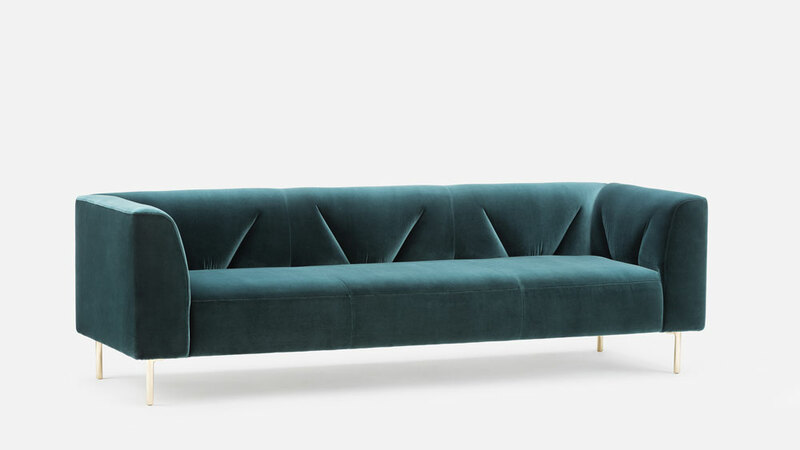 Robb Report does not joke about the sofa. Jason Miller tackles this one head-on. Gates, designed for London-based brand De La Espada, is as direct as it gets: a smart, contemporary upholstered form made of maple that stands on clean brass legs. Its no-fuss attitude is immensely appealing, as there is nothing too overwrought or too detailed about it — a winning aspect given that most of us aren’t subbing in sofas with frequency. That understated approach makes sense; Miller is an American industrial designer. While most can barely handle one job, he has two — acting as the creative lead of his namesake furniture studio and the founder of Roll & Hill, a maker-centric lighting collection with all the right street cred. His furniture designs are workshop favourites, with seating and tables that benefit from being made by hand rather than joining an assembly line. It’s worth nothing that this week, the design world saw Gwyneth Paltrow and the Goop team release a furniture collection with mass retailer CB2. While that eliminates any doubt about the influence of “lifestyle” products, it opens up broader questions about what we want to create in our own interiors. Paltrow is undoubtedly playing to her fan base (and possibly her own tastes) turning out a series of 42 pieces, including a firewood tote and curvaceous pale pink sofa. The De La Espada client might appreciate Goop living in theory — but not in design practice. Aspirational, inspired ideas about how we live are great, but eventually you need to find something to sit on in the living room. Miller, riffing on Mark Twain’s sage advice to “write what you know,” found his own inspiration for Gates close to home. Literally. The Brooklyn-based designer drew from the area’s real estate transformation, particularly with the conversion of century-old brownstones. Once apartment buildings, these structures are now being converted back to single-family homes where period-correct details — like embellished fireplaces, mouldings, and woodworking — reign for their authenticity and a slice of easy-to-love history. Miller’s design was a response to this convergence of eras and aesthetics. Although we get the 21st-century luxury of choosing upholstery in fabric or leather, we also need to wait the requisite 16-week lead time. Just like the olden days.